Compiling nearly 200 years of history into a single image is no easy feat, but Carmel High School senior Sydney Remble managed to do it. 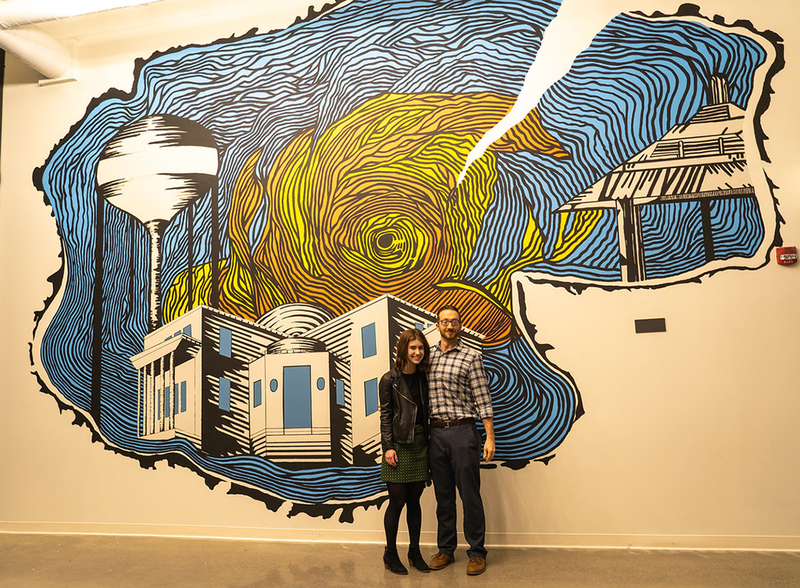 In 2017, real estate company Ambrose Property Group organized a school-wide mural contest in hopes of filling the new MJ Insurance building in Midtown along the Monon Trail with art by Carmel residents. When CHS art teacher Andrew Murray learned about the competition, he immediately brought it to his students’ attention. “I knew I had access to students in AP art classes who are able to create awesome things, are interested in art and would be willing to put in effort to make something spectacular,” Murray said. When Remble, one of Murray’s students, heard about the contest, she brainstormed ideas. Incorporating vivid colors with stark black-and-white elements, the mural stretches from floor to ceiling of the MJ building’s lobby. The hard work paid off. On Jan. 17, Pat Chittenden, executive vice president at Ambrose Property Group, presented Remble with a $2,000 check and congratulated her on the winning design.